My daughter Christina and I were in the cashier line at the grocery store. You would think a kid would be tempted by the rows of candy and gum, but not Christina. Her hand went straight for a woman's magazine picturing well-designed pumpkins and claiming to have 178 new ideas for Halloween. What inspired Christina was not the 178 new ideas that the magazine's editors and writers worked on, but the M&M advertisement section at the end of the magazine. The insert featured recipes using, you got it, M&Ms, and other brand products. She saw this picture of crispy pumpkin treats and wanted to make them. We picked up the ingredients -- Rice Krispies cereal, marshmallows, caramel chews, butter, and chocolate -- and Christina went to work. She measured out her ingredients and unwrapped dozens of caramel chews. Then she melted the marshmallows, butter, and caramels together and mixed that sticky, gooey mixture with the cereal. She spread the mixture out on a foil-lined jelly roll pan. 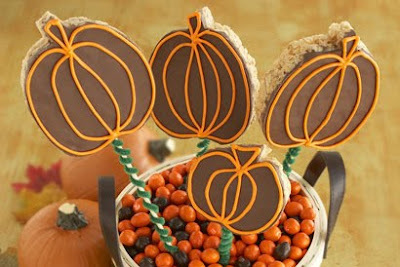 Faced with the choice of making rice crispy squares which could be eaten in minutes and pretty, chocolate-coated and orange-piped pumpkins on sticks, Christina punted. She melted one cup of chocolate chips in the microwave, dipped a fork into the melted chocolate, and drizzled the chocolate onto the squares. Then she cut off two pieces and went on her way. 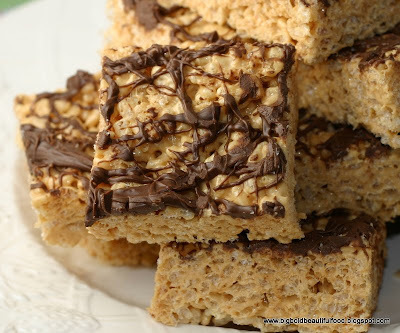 I used to love rice krispie squares, but never had them with chocolate. It looks like the perfect addition =D! Oooh, aren't those the best? I'm always disappointed when they're made with peanut butter b/c I'm allergic. Way to go caramel! MMMMMMMM,...these squares look the best!